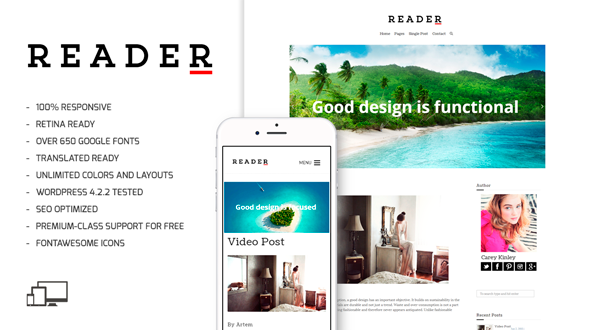 READER is a premium, minimal and responsive WordPress theme for bloggers. READER is a Personal Blog WordPress Theme perfect for your needs, it offers the latest features in an elegant design. READER built on a very powerful and flexible Foundation 5 framework by ZURB. READER WordPress theme is translation-ready. You can translate it to any language as well as set it up for multiple languages. It includes a .POT file that is used to create .po/.mo files in the language you need. A great advantage of the READER WordPress theme that it is not only multilanguage translation ready, but has already been translated into 15 the most popular world languages: Chinese (Simplified), Chinese (Traditional), Swedish, Ukranian, Spanish, Italian, French, Russian, German, Polish, Greek, Dutch, Danish, Hindi and Arabic! READER has a striking balance between beautiful design and functionality. Reader looks great on any device, from mobile to desktop and beyond. Reader is translation ready with the included .pot language file. Reader is ready to help you get higher rankings because we have built it with SEO best practices in mind. Reader uses semantical valid HTML code and CSS which allows search engines to easily index the content of your site. Premium support and free updates. When you purchase a copy of Reader you gain access to 5 star customer support and free updates. Custom Backgrounds – Reader allows you to set a custom background. A super-quick way to get creative with your site. The current version is 1.0.4: Released on August 26th, 2015.